Time for an Early Season Jig Bite! 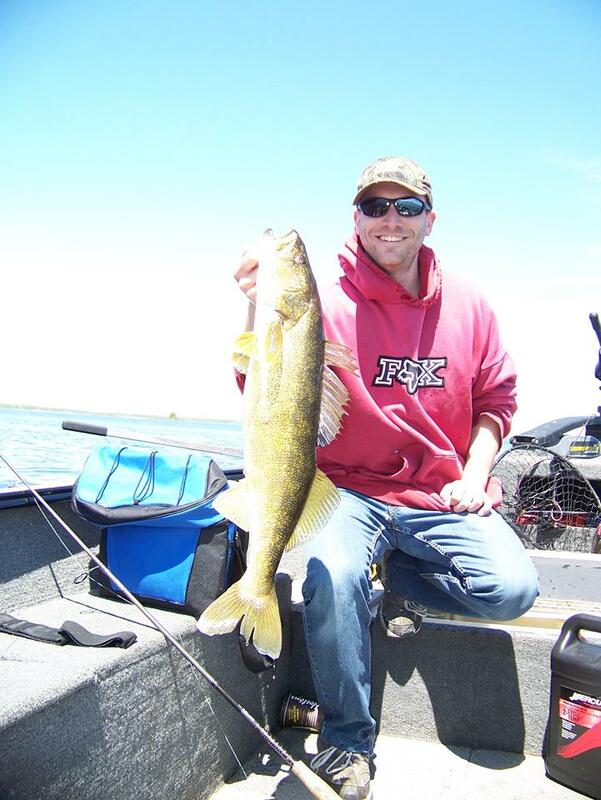 The 2014 season is well underway, and with it comes the yearly challenge of finding early season big walleyes until they make their way to summer haunts. Where big fish go in the spring is always a little bit of an enigma, and the answer seems to be, well, a little bit everywhere. Some fish seem to stay up rivers longer than others, some will relate to edges and drop offs, some will be really deep near structure. The great thing about spring, it’s one of my favourite times of year to explore and get onto a solid jig bite. I have to admit, I’m a troller first and foremost. I pull spinners and plugs 75% of the time. It’s not because I prefer it, but rather because it’s what seems to put fish in the boat with the most consistency, particularly once the water warms up to 65F. When the water is still frigid though, fish tend to be less responsive to those horizontal presentations and that’s where covering lots of water with jigs and vertical jigging spoons can really pay some big dividends. If I had the choice to catch the bigger fish, or any fish for that matter, on a jig or say trolling crankbaits, I will pick the jig bite any day of the week. There’s no engine noise, no rigs, sinkers, and you feel your way along as you drift. When a walleye takes your jig, and you set the hook to feel that first big headshake there’s nothing quite like it. 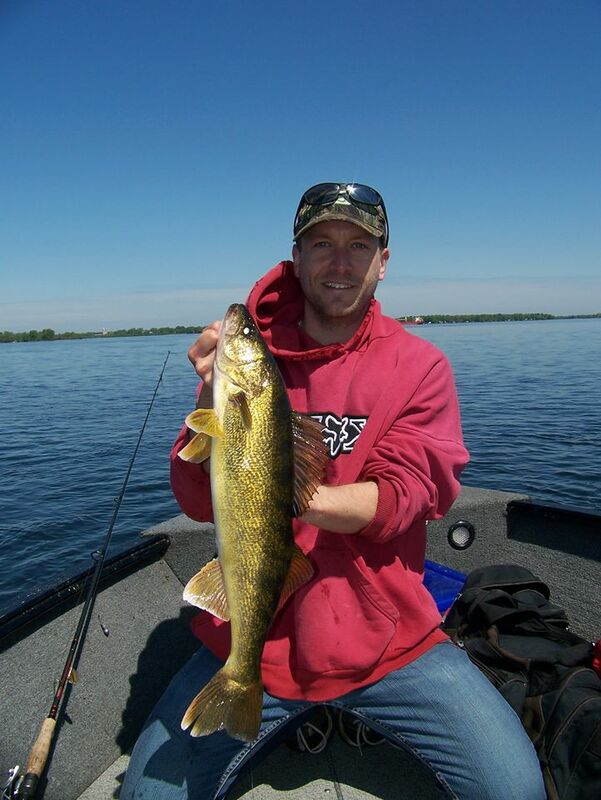 When you get into fish over 5lbs on jigs you will find yourself hooked and looking for more. In a river situation, where you have current and breaks a jig can actually cover a lot of water in a short period. 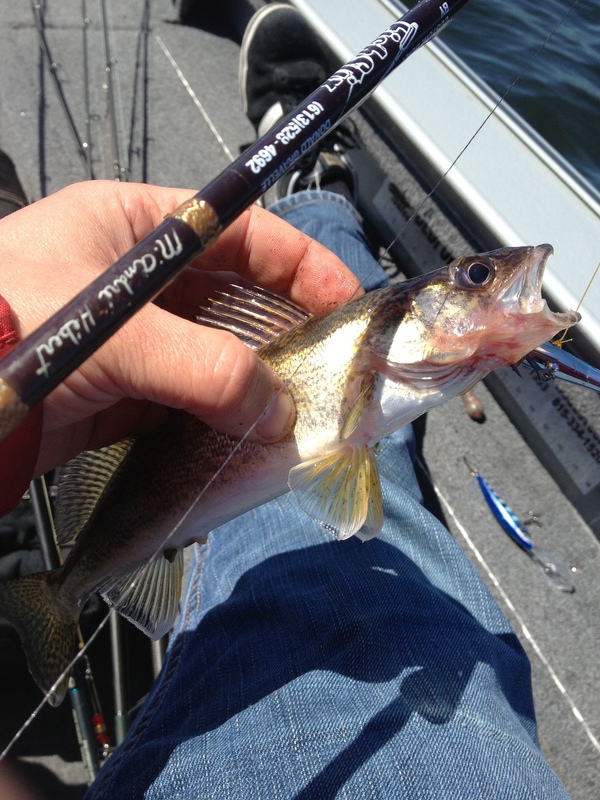 In my experience, early season walleyes, particularly larger ones, are a little more spread out than they are in the summer, so covering a lot of water is a must. A good friend of mine, Simon Lavictoire, who also happens to be one of the best jig fishermen I know has tought me a lot about jigging and particularly on boat control techniques. The first thing that is a must is a good strong bowmount trolling motor. 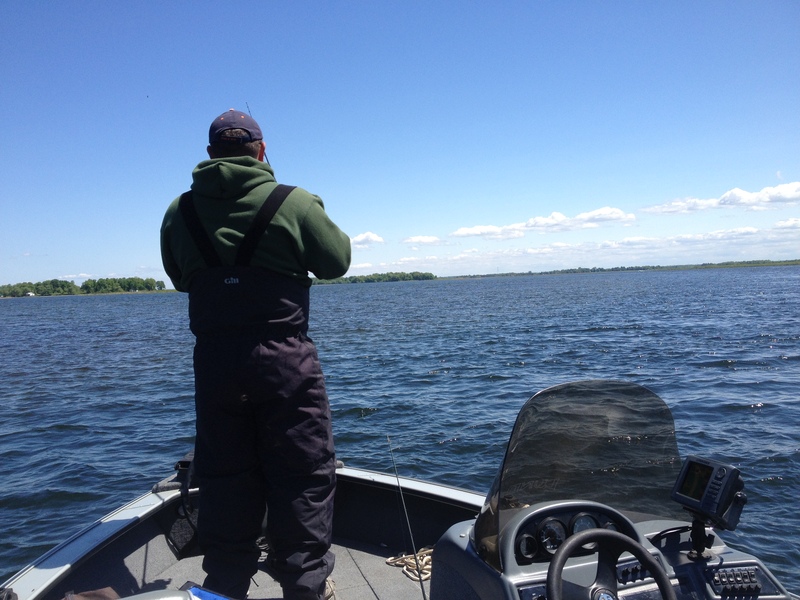 I use a 24 volt 80lb Thrust handheld Minn Kota with a 42″ shaft and it moves my 16 foot Lund fast enough to water-ski. When you are fishing current, sometimes moderate to strong, you need to be able to make quick adjustments to make sure your jig is vertical. It’s also important to be able to move against the flow quickly in the event of a snag, which are a regular side-effect of drifting jigs unfortunately. The hand-held feature is a personal preference. I never really got completely comfortable with the pedal control and in rough water and current I just find the hand held much easier to work with. I also save a lot of space in the boat that way. As far as the business end goes I’m always experimenting and still picking up some tricks here and there. I’ve had success with flutter spoons, jigging raps, tubes, platic worms and grubs and minnow imitations like TriggerX, Gulp Alive and Berkely Power Minnows and bucktails. All of them will work. I rarely go with a jig under a half ounce and usually fish a 3/4oz jig head. I like to use a 7 foot medium action spinning rod with a fast action so I can really control that jig with the rod tip and feel for what’s on bottom. You learn to almost read the type of bottom where a walleye is likely to be just by feeling your way around with the jig. It becomes your exploring tool. Using a good superline is also a must. I’ve used Powerpro and Fireline and they both do the trick. Just make sure you tie on a fluorocarbon leader and keep checking it. Those zebra mussels really eat them up quickly. Simon prefers the backbone of a baitcasting outfit. He is using Dobbins rods right now and I have tried them up north jigging for lake trout and I have to say they absolutely excelled. It also depends on the lure you’re working. For jigging spoons the baitcasting outfit seems to allow you to work those vertical “pops” a little easier, whereas if you’re going for a more subtle, constant bottom contact presentation I find the spinning rod gives me a bit more “feel”. I’ve had a fun time finding fish on jigs this spring, especially since we’re having such a late season. 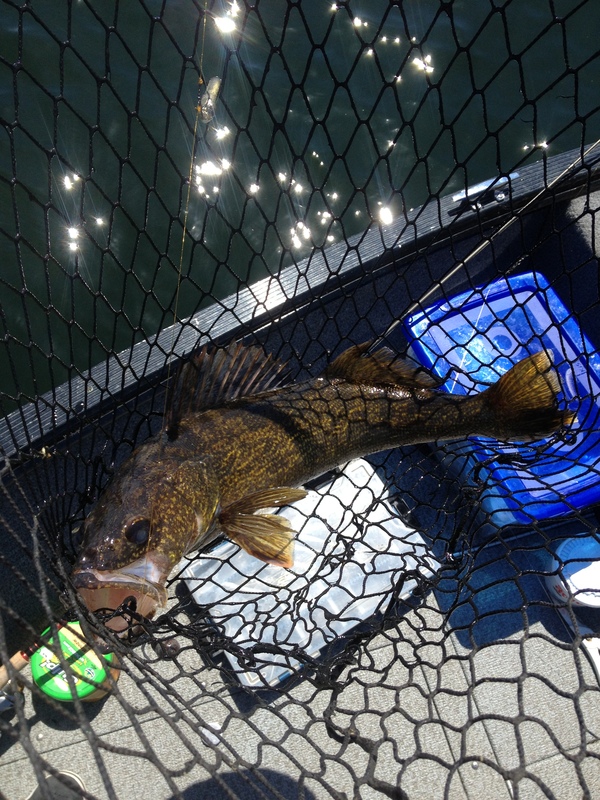 If you’re having a rough time finding fish trolling your normal spots in the cold water give jigging a try. Just remember, jigging requires a lot of patience. Once you know it works, you’ll just want more I can promise you that! Until next time, Stay Outside!